Abstract. Changes in climate affected human societies throughout the last millennium. 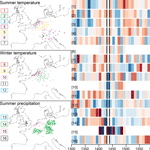 While European cold periods in the 17th and 18th century have been assessed in detail, earlier cold periods received much less attention due to sparse information available. 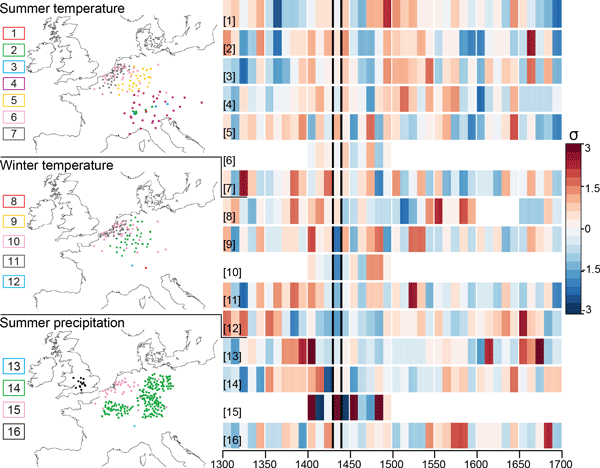 New evidence from proxy archives, historical documentary sources and climate model simulations permit us to provide an interdisciplinary, systematic assessment of an exceptionally cold period in the 15th century. Our assessment includes the role of internal, unforced climate variability and external forcing in shaping extreme climatic conditions and the impacts on and responses of the medieval society in north-western and central Europe. How to cite: Camenisch, C., Keller, K. M., Salvisberg, M., Amann, B., Bauch, M., Blumer, S., Brázdil, R., Brönnimann, S., Büntgen, U., Campbell, B. M. S., Fernández-Donado, L., Fleitmann, D., Glaser, R., González-Rouco, F., Grosjean, M., Hoffmann, R. C., Huhtamaa, H., Joos, F., Kiss, A., Kotyza, O., Lehner, F., Luterbacher, J., Maughan, N., Neukom, R., Novy, T., Pribyl, K., Raible, C. C., Riemann, D., Schuh, M., Slavin, P., Werner, J. P., and Wetter, O.: The 1430s: a cold period of extraordinary internal climate variability during the early Spörer Minimum with social and economic impacts in north-western and central Europe, Clim. Past, 12, 2107-2126, https://doi.org/10.5194/cp-12-2107-2016, 2016. Throughout the last millennium, several cold periods occurred which affected humanity. Here, we investigate an exceptionally cold decade during the 15th century. The cold conditions challenged the food production and led to increasing food prices and a famine in parts of Europe. In contrast to periods such as the “Year Without Summer” after the eruption of Tambora, these extreme climatic conditions seem to have occurred by chance and in relation to the internal variability of the climate system.